Linndale Equipment is located in southwestern Ohio with easy access to I-71 and approximately 40-50 miles from Cincinnati, Dayton and Columbus, Ohio. We have been selling equipment for over 30 years with special emphasis o­n soil conservation tools. 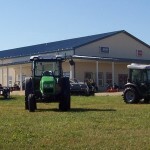 We’ve used and tested many of the implements we sell in our own farming operation. Our desire is to offer our customers quality tools to accomplish their work and friendly service to back it up.